The 2009 model year SC 430 luxury hardtop convertible receives new side mirrors with incorporated turn signals and will have a base MSRP $66,805, an increase of 0.7 percent or $450. The 2009 LX 570 will be available in an all-new Costa Azul Mica exterior color and will feature an available Luxury Package that includes semi-aniline leather-trimmed seats, Bubinga wood-trim, cool box, smart card key and 20-inch alloy wheels with a unique finish. The LX 570 base MSRP will be $75,705, an increase of 1.3 percent or $1,005. 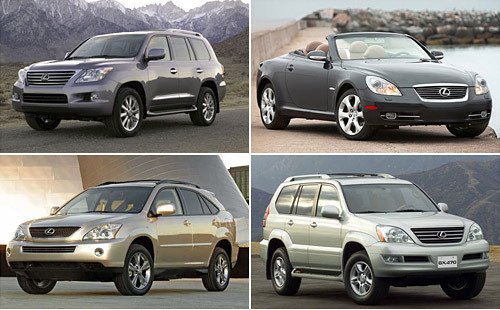 The GX 470 carries over unchanged for the 2009 model year and will have a base MSRP of $47,615, an increase of 0.6 percent or $300. This would seem to contradict the Edmunds report that the SC would be cancelled, though sales are bound to be even less than this year. Too bad about the GX, though, I was hoping for an update of some sort.